VATICAN CITY (CNS) — There is no growth without some form of crisis and no victory without a battle, Pope Francis told a group of Jesuits. In fact, “the worst evil that can happen to us,” he said, is growing complacent, self-satisfied and worldly in one’s spiritual life, too, he said. 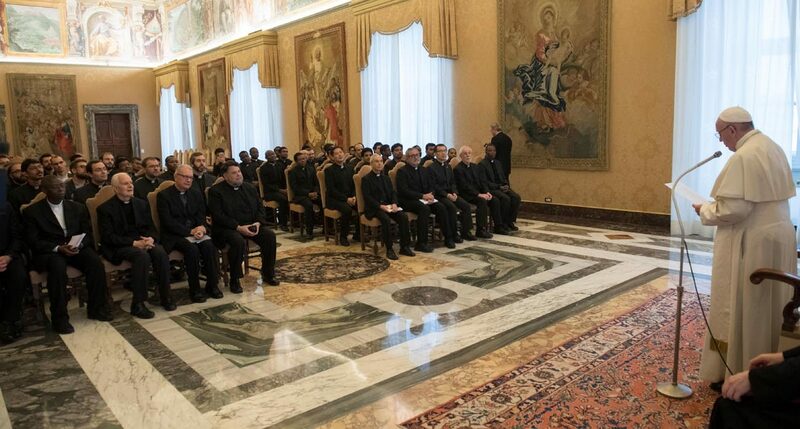 The pope spoke Dec. 3 with staff and students of Rome’s International College of Gesu, founded by the late Jesuit Father Pedro Arrupe in 1968. The pope told the community that they are called to strengthen their roots in God and grow in love. “The plant grows from the roots, which you don’t see, but they hold everything. And it ceases to give fruit not when it has few branches but when the roots dry out. To have roots is to have a heart that is well-grafted” to God, enabling that heart to expand and be alive, he said. “To grow and to put down your roots means to fight without rest against every spiritual worldliness, which is the worst evil that can happen,” he said. If such worldliness “attacks the roots, then goodbye fruit and goodbye plant. For me, this is the greatest danger right now — spiritual worldliness that leads you to clericalism and so on,” he added. Two positive signs of growth, he said, are obedience and freedom, freedom from oneself and the slavery that selfishness would bring.